Yup, my "Seedless Watermelon Smocked Top Dress" is finally complete! This is officially the biggest thing I've ever knit, and took the most skill. 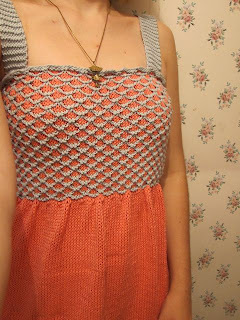 The smocking pattern wasn't so bad once I got it figured out, but this garment took more finishing (and consequently patience) than anything else I've made. 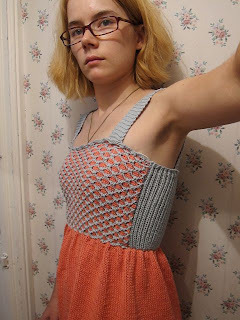 There was a fair amount of sewing involved, as well as endless sewing-in of ends, endless stockinette for the skirt and it even has elastic woven into the top and bottom of the bodice to make it fit better (otherwise it sags, its heavy). What can I say except that I'm delighted with the way it turned out and can't wait to wear it! holy moly, that is a gorgeous dress - I love it!